At dinner time last night the winds were only about 18 knots from just off the beam, so we decided to leave the full main up while we enjoyed our mashed butternut squash with garlic and fresh marinated tuna fillet. For the second night in a row the sun set into an almost cloudless horizon so we've enjoyed 2 green-flash sunsets in a row, our first for 2 years. But the winds piped up when Sue got Jon up for his 8 pm‑midnight watch so we reefed the main then. 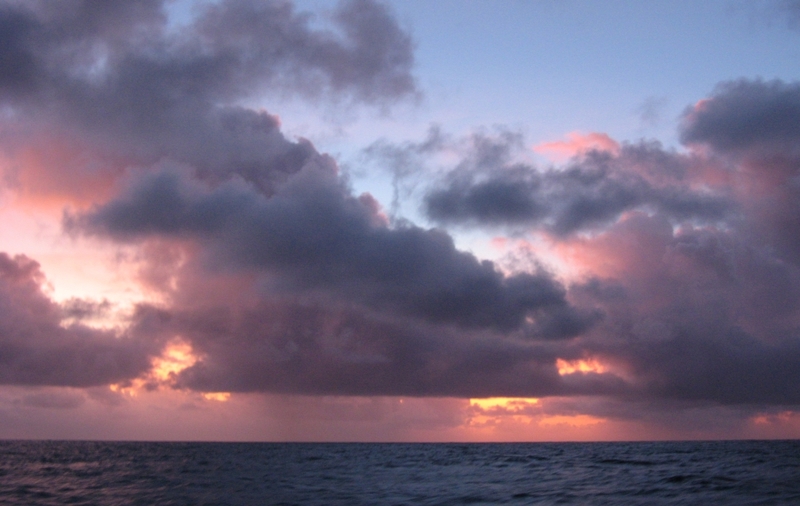 The winds have continued at 18‑23 knots so we've left the reef in. Ocelot's been sailing happily at 7‑8 knots. For lunch Sue served some of last nights excellent marinated tuna with a lovely tomato, feta cheese, and basil salad with her homemade vinaigrette, and some mango-cake for desert. It's so wonderful to be eating such delightful food while Ocelot sails through warm tropical breeze over the whitecap flecked deep blue ocean under a pale blue sky. 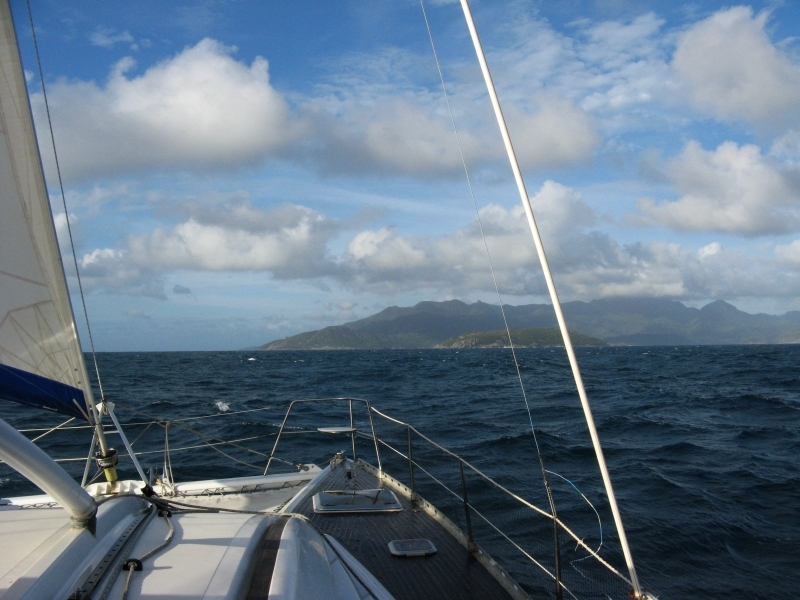 At noon today we were at 8°04'S 53°36'E, or 234 miles from the southern tip of Beau Vallon beach in the Seychelles. We've sailed 355 miles from Madagascar (and over 2000 miles from Richards Bay), 172 in the last 24 hours. This morning the current finally turned to be a bit more favorable to us, 0.5 knots flowing 105° at noon, so we're actually getting a slight assist from it. We've actually been sailing a bit east of our route in case the winds come around ahead of us - sort of banking some easting while we can, just in case. But this afternoon we ran into a bit of confused ocean and decided to turn off so Ocelot would ride easier. Turning off 25° brought the wind slightly aft of the beam, giving us a much smoother ride and allowing us to shake out the reef in the main. Land HO! At about 2 pm this afternoon we crossed onto the Seychelles Plateau. The main islands that form the Seychelles are on a large shallow bank. Crossing from deep water to this shallow bank can be rough, but we entered at a relatively protected spot and had no problems. 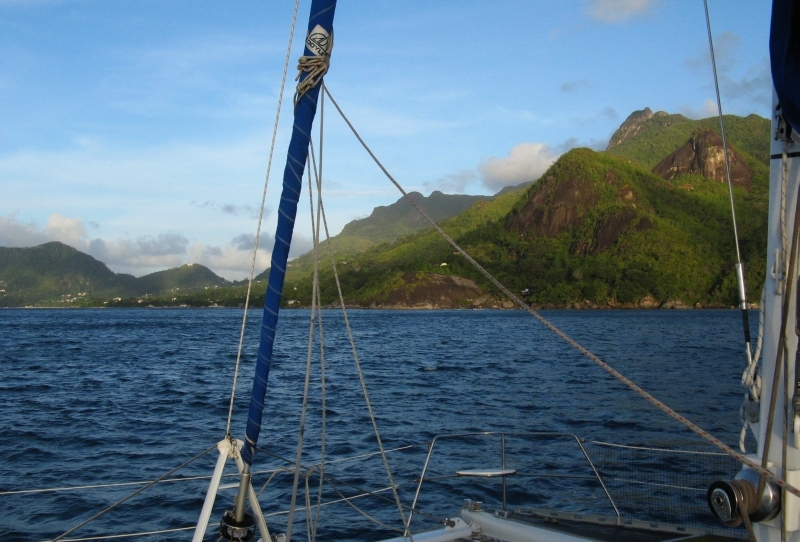 Shortly after that we spotted the main island of Mahe. Sue has been having lots of fun identifying all the birds around us - much as she remembers the Seychelles from 2007. We had a pretty amazing sail last night. As we mentioned, yesterday afternoon we turned off the wind slightly and shook out the reef in the main. This brought the wind to about 110° which put Ocelot in her power-reaching mode. We didn't just sail last night, we FLEW! We never got below 6 knots and the GPS says we hit 13.3 last night (and 13.7 this morning, and 14.6 this afternoon) with long stretches of 8‑9 knots. There's some phosphorescence in the water here so we had twin trails of glowing water shooting out behind us as the milky way glowed above us. At those speeds Ocelot's handling changes - the helm gets very light and responsive, and her bows pick up so she just scoots along the tops of the waves. The ride was actually very comfortable. Down below the water swished past the hulls in a mighty WHOOSH but the ride was flat enough to sleep! Very cool. This morning we turned off slightly again, dodging between sea-mounts. The ocean floor is 3‑4,000m (10‑15,000') deep, but it's pocked with mountains that can rise up to within only a few hundred feet of the surface. The waters around these sea-mounts are great fishing, but bad sailing. The ocean surface gets very choppy as currents well to the surface unpredictably, sort of like the turbulence when flying an airplane past a mountain. The Seychelles are truly gorgeous - huge granite outcroppings covered with lush tropical vegetation. Arriving in the late afternoon put a lovely orange glow on the trees, making them all the more appealing. The Seychelles makes arriving yachts anchor in an open and unprotected anchorage while they process us. (Singapore is the only other country we've visited that does this but they operate 24/7, which the Seychelles does not.) That anchorage is not a place we can go to in the dark (and we couldn't get there in daylight) so we spent the night off Beau Vallon beach. We'll go around to the quarantine anchorage in daylight.